Made from discarded traffic light lenses from the City of Battle Creek & the Niagara Region’s LED light replacement initiative. Re-use of common elements is central to my work. I hope to inspire people to think of discards in different ways and to increase awareness of environmental conservation by experiencing my sculpture. As a “grass roots” sculptor, it is important to me to show people the beauty of our community and to encourage alternative thought. These sculptures are very approachable, up- beat and fun, and would be an excellent addition to a Children’s Garden or a Garden Trail since these types of gardens showcase “more whimsical representational works seen within settings that add to the garden experiences”. This work was a challenge to see things in a different way.Can you picture a whole field of giant Traffic Flowers…would that be a traffic (flower) jam? 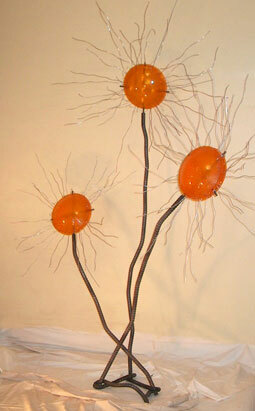 Materials Used: Forge-formed Rebar, Traffic Light Lenses, Mirror, Aluminum Wire. Dimensions: 9 feet high x 4 feet wide x 2 feet deep; 100 lbs. 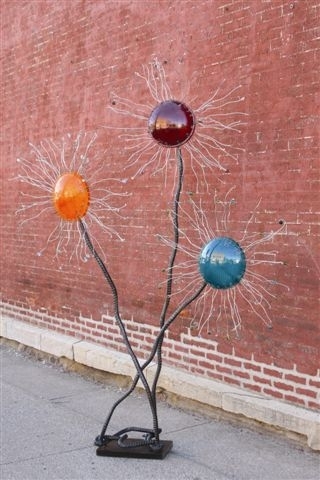 Installation: Exterior: Either bolted to a concrete pad, or “planted” into the ground using special cork-screw-type lags created for this sculpture. Interior: bolted to a steel base created especially for each sculpture.